Try not to fall out of your seats–it’s a new post! Exactly one year ago today, our family and lives were made complete with the adoption of our daughter, Violet. This year we just had to do something special for “Violet Day,” the day we became a forever family. 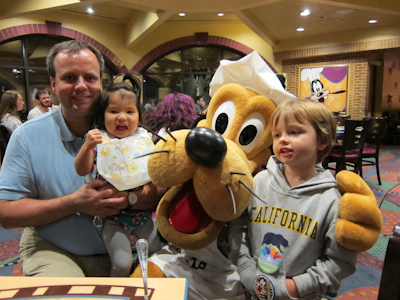 Doing something at Disneyland was a no-brainer, so we decided to eat at Goofy’s Kitchen, the character meal inside the Disneyland Hotel. We were greeted at the door by the Goof himself. 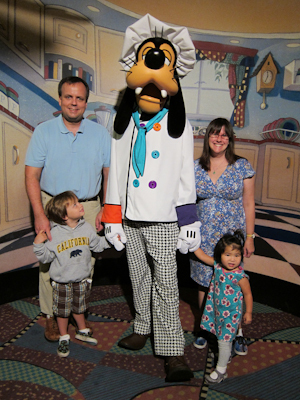 Now there are two basic aspects of Goofy’s Kitchen–the characters and the food. This post I’m going to cover the characters–next will be the food. 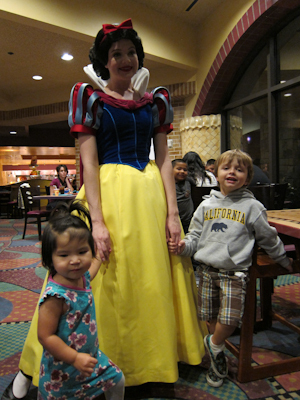 The very first character we saw was Violet’s favorite princess, Snow White. 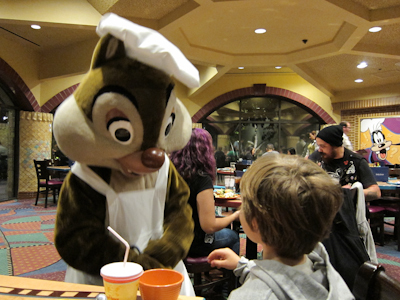 After Snow White, Chip came by. 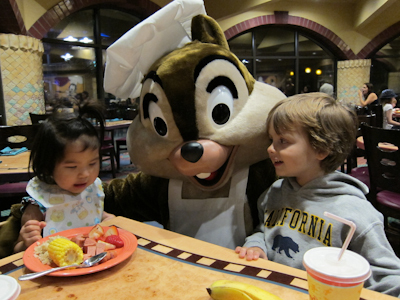 Theo has now learned to tell Chip and Dale apart. I remember them because a reader pointed out to me that Chip has a small black nose like a chocolate chip, while Dale has a reddish-brownish bigger nose. Also at Goofy’s Kitchen they wear aprons with their names conveniently embroidered on them. Violet didn’t want to be torn away from her food here. After Chip was the Pièce de résistance, Violet’s personal hero Minnie Mouse. 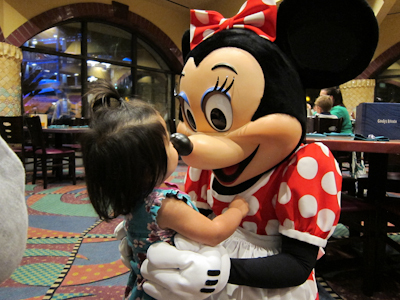 This girl LOVES Minnie. I mean LOVES. She calls her “Mow Mow” (she’s got a speech delay and Minnie is one of the few words she has). At first Theo is looking a little funny but you can see the adoration on Violet’s face. 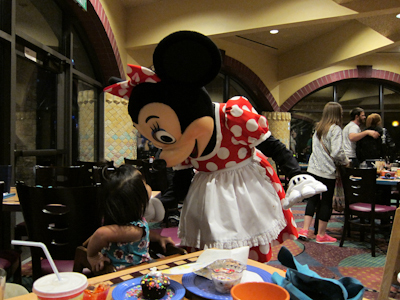 Then Violet got to share some one-on-one time with Minnie. A great thing about Disney is that they don’t rush kids through the character experience. 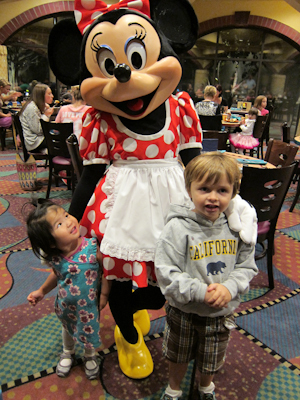 Violet loved every second of Minnie’s visit. Next to come by was Aladdin. He playfully made fun of Violet’s “genie hair”. And then Dale came by. 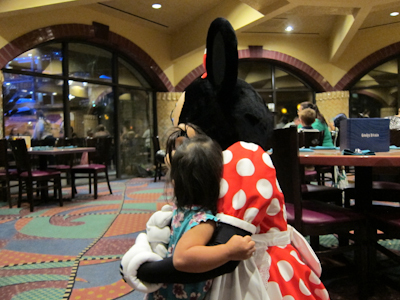 Much to Violet’s delight, Minnie took another swing through the room and shared another hug and kiss. 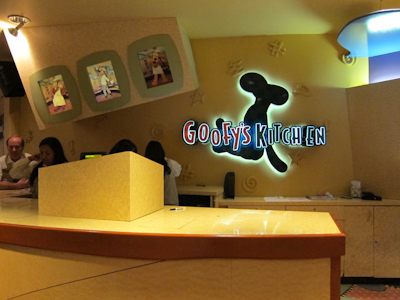 In short, Goofy’s Kitchen is awesome. 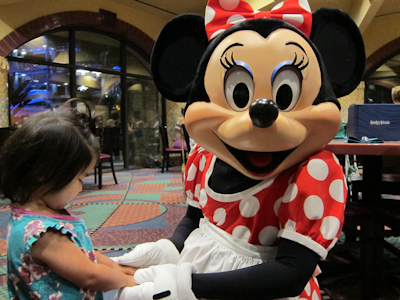 It doesn’t require park admission, since it’s in the Disneyland Hotel itself, and it’s a great way to catch a few characters while enjoying a fantastic buffet (especially the desserts–stay tuned for those). They do brunch and dinner and I’ve had both. I probably prefer the brunch because I basically think that breakfast is the best meal of the day, if not the entire universe, but the dinner was great too. 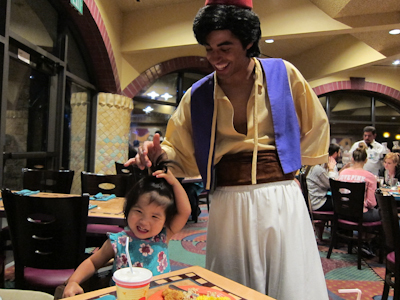 The characters vary, but my kids didn’t really care who showed up and were thrilled with everyone. How precious and congratulations on one year as Violet’s family. I agree, I prefer Goofy’s breakfast over dinner. Thanks Traci :). I did like Goofy’s dinner but the brunch is really amazing and I highly recommend it :). It’s good to be back! Now that things aren’t as crazy I hope to be stopping in more. It’s a great way to get your Disney fix without having to buy the whole pass, plus it’s just a lot of fun. Congratulations on the one year anniversary of your forever family! And I’m thrilled to see the return of My Year With the Mouse, especially since your blog inspired me to write about my life with LEGO. Thanks Lyn! And I love your Lego blog too :). A post! I was excited. Can’t wait for the rest. Theo looks, big. So grown up. What a beautiful little girl. Good luck. Can you believe how little Theo was when I started this blog vs. what a big boy he is now??? 15 minutes are usually lost just trying to figure out how to begin. Any suggestions or hints?